Did you know that not only is aluminum linked to Alzheimer’s but according to Dr. Mercola’s website, it’s also linked to breast cancer? “A 2006 study found that aluminum salts can mimic the hormone estrogen, and chemicals that imitate that hormone are known to increase breast cancer risk. Animal studies have also found that aluminum can cause cancer. From my research, it seems that the deodorants are not as troublesome as the antiperspirants. But I’m not going to risk it. 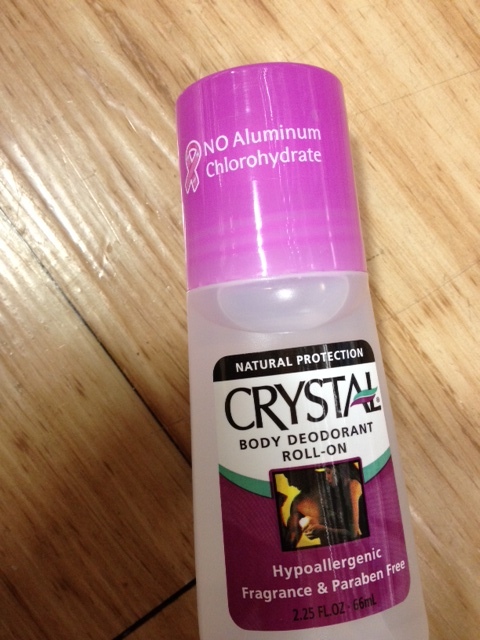 Antiperspirants have a double whammy of the aluminum penetrating your skin and blocking your sweat glands. You are supposed to sweat. Don’t block it. I was so embarrassingly late to the party on this one item after I had spent two years getting rid of every toxic thing in my house. My friend, who knows how neurotic I am, casually asked me which deodorant I used and I proudly told her about the crystal. With wide eyes, she informed me that it contained alum, which is none other than potassium aluminum sulfate. Aluminum. Dang it. I think because my deodorant/antiperspirant was something I switched to years ago, I just continued to believe the label. I wasn’t used to delving deep. Most of us heard long ago that there is a link between aluminum and Alzheimer’s disease so we changed to the crystal that made the claim, “No aluminum.” But alas, they have tricked us. Many people have found that they can go without deodorants. I most likely can during the normal day, but I regularly attend hot yoga class. I don’t want to find out in the middle of a 100 degree class that I stink. I bet the people in the class surrounding me don’t want me to experiment either. So this is what I have been doing; I sprinkle baking soda under my arm pits. Yep. Good old, baking soda. I have done this for four months to make sure it was not a fluke and that it worked EVERY DAY. I can say with all honesty that my baking soda pits have withstood 68 hot yoga classes without failing me. This is my methodology. I pour a little baking soda on to my finger tips and apply while naked. That way if any falls, it won’t get on to my clothing. I also do this in my closet which has carpet instead of flooring. The extra soda can fall into the carpet and I can lazily ground it into the carpet, freshening it and saving me from wiping up the floor. The only potential challenge has been traveling with my baking soda in a snack size baggie. I look like I just paid a visit to Tony Montoya. Oddly enough, the TSA has shown little interest in my baggie full of baking soda. It is very cool, and she smells great, even after yoga. I however, do not want to spend $30 on my armpits. I’ll stick to my $.58 baking soda. oh no…..this seems scary! But I like your baking soda idea. Also…great job with the hot yoga class…I did classes when I was visiting family in Houston…it was FAB! Where in Houston did you go to hot yoga? Well….actually Katy. It is a suburb in west Houston. I don’t know the name because it was my sis’ studio. But it was a Bikram class. Anyway…it was tough in the beginning, but I loved it. Unfortunately there are no hot yoga or Bikram classes in my town. There are in Milan…but ggggrrr…we are not living there anymore! I was asking because I LOVED my yoga teacher in Houston. It was in West Houston, but not as far as Katy. Well…when I was going, they rotated the instructors, we went 2-3 times per week and I had probably 5 different teachers….they all had totally different styles, but I loved them all. GGGRRRR….would love, love, love to find a place here. In the meantime I have some stuff I at home….still…nothing like that crazy hot room! It’s not proven that it can cause Breast Cancer. Many things are suspected to cause cancer or people claim that are dangerous or hazardous for you that actually wind up not being true at all. Thanks for the comment. I will look into the Fresca natural! I appreciate it. I’m also a Bikram Yoga fan so understand the need for good smells at all temperatures!! Thank you! That is wonderful. Yes, I think the alum in a DEODORANT may be “okay” but I just don’t want to find out the hard way. Give the baking soda a try. It’s so inexpensive and it really works!